The Beardy's Midget AAA Blackhawks became a part of the Saskatchewan Midget AAA Hockey League in 1995. The Team played it's first 2 seasons (1995-96 and 1996-97) as the St. Michael's College Thunder. All the players were billited and educated at St. Michael's College (Residential School). With the closure of the College, the team played the 1997-98 and 1998-99 seasons as the Willow Cree Thunder. This led to the 1999-2000 season where the program was renamed the Beardy's Midget AAA Blackhawks. For 3 consecutive seasons (1999-2000, 2000-2001, and 2001-2002), the Team has qualified for the prestigious Mac's International Midget AAA Hockey Tournament in Calgary, Alberta. The program's 6th season (2000-2001) in the league brought forth their best on-ice success. In November, The Blackhawks won the 2000 Ice Mania Tournament in Prince Albert, Saskatchewan. 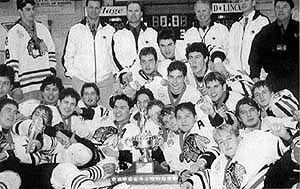 Then, The Beardy's Midget AAA Blackhawks went on to become the 2000-2001 Saskatchewan Midget Hockey League Champions and the 2001 Air Canada Cup Western Regional Champions!